Dr. Foivos (Phoevos) Koukouvinis graduated from the department of mechanical engineering of the National Technical University of Athens (NTUA) in 2008. After that, he attended a post-graduate specialization programme on power production and management in NTUA and started his work as a PhD candidate in the department of fluids, laboratory of hydraulic turbomachines. He successfully finished his post-graduate studies in 2010. In 2012 he completed his PhD research, in the field of hydraulic turbine optimisation, design and experimental testing. In 2013 he was appointed as a post-doctoral researcher (Marie Curie/Research Fellow) in City, University of London, working on the subject of cavitation erosion. Currently he is lecturer in City, University of London, teaching the course of thermodynamics to first year students and participating in research in multiphase, compressible flows. Technical Chamber of Greece (2012) Award by the Technical Chamber of Greece for the undergraduate academic performance (12/9/2012 - first class student). English (can read, write, speak, understand spoken and peer review), French (can read, write, speak and understand spoken), German (can read and understand spoken) and Greek, Modern (1453-) (can read, write, speak, understand spoken and peer review). Dr. Koukouvinis is working on the development, implementation and verification of computational models for multiphase flows with or without phase change. Emphasis has been given to the phenomena of cavitation, material erosion and liquid flashing taking into account real fluid thermodynamics and turbulence effects, with applications mainly in the area of fuel injection systems. Other areas of research involve compressible, multiphase flows with resolved interfaces, as e.g. in fundamental bubble dynamics, or incompressible multiphase flows, as in e.g. impulse hydraulic turbines. 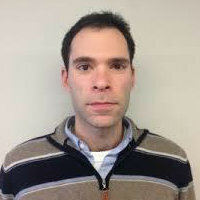 Dr. Koukouvinis has experience in numerical techniques (such as Finite Differences, Finite Volume, Finite Element, Smoothed Particle Hydrodynamics), programming (Fortran, C, with shared memory or distributed memory parallelization). During the post-doctoral researcher period at City University, Dr. Koukouvinis participated in the FuelSystem3000 (Marie Curie Industry-Academia Partnerships and Pathways, EU Project ID: 324313, web-page: http://fuelsystem3000.eu/). The project focused on cavitation, compressible, multiphase flows, erosion and was mainly oriented towards (but not limited to) Diesel injectors. The main investigation subjects involved material erosion, turbulence interaction with cavitation, real-fluid thermodynamic effects, heat transfer in fuel system components and compressible multiphase flows (either resolved or diffuse-interface). Dr. Koukouvinis has also participated in experimental campaigns for cavitation and erosion measurement with novel techniques (e.g. X-ray densitometry, CT scans). Among the most important findings of his research is the formulation of a numerical model capable of quantitative predictions of cavitation presence and cavitation impact loads that can be related to material fatigue over time. During the PhD candidate period at Laboratory of Hydraulic Turbomachines, Department of Fluids, NTUA, Dr. Koukouvinis was mainly involved in the Hydroaction project (EU Project ID: 211983, web site www.hydroaction.org). The project objective was the development of novel methodologies and design tools for optimizing impulse hydraulic turbines. His contribution to the project was the development of in-house CFD algorithms (based on the Smoothed Particle Hydrodynamics method, programmed in Fortran/C with shared memory parellism), setting up simulations with the available/developed software, conducting optimization studies for runner geometries/penstrock shapes, designing and manufacturing a turbine prototype runner (taking into account both fluid dynamic and structural aspects) and conducting laboratory measurements. Dr. Koukouvinis also provided assistance to partners/colleagues with the set-up of CFD simulations for Francis hydraulic turbines covering the whole analysis cycle and in research contracts for private companies (in particular (JV Aktor). Finally, he has been involved in the tutoring of under-graduate students during laboratory exercises in the Hydraulic Turbomachines lab. Anagnostopoulos, J.S., Koukouvinis, P.K., Stamatelos, F.G. and Papantonis, D.E. (2012). Optimal design and experimental validation of a turgo model hydro turbine. Koukouvinis, P.K., Anagnostopoulos, J.S. and Papantonis, D.E. (2009). Turbulence modeling in smoothed particle hydrodynamics methodology: Application in nozzle flow. Stavropoulos Vasilakis, E., Kyriazis, N., Koukouvinis, P., Farhat, M. and Gavaises, M. (2019). Cavitation induction by projectile impacting on a water jet. International Journal of Multiphase Flow, 114, pp. 128–139. doi:10.1016/j.ijmultiphaseflow.2019.03.001 . Mithun, M.-.G., Koukouvinis, P. and Gavaises, M. (2018). Numerical simulation of cavitation and atomization using a fully compressible three-phase model. Physical Review Fluids, 3(6). doi:10.1103/physrevfluids.3.064304 . Koukouvinis, F., Bruecker, C. and Gavaises, M. (2017). Unveiling the physical mechanism behind pistol shrimp cavitation. Nature Scientific Reports, 7(1). doi:10.1038/s41598-017-14312-0 . Koukouvinis, P., Gavaises, M., Supponen, O. and Farhat, M. (2016). Simulation of bubble expansion and collapse in the vicinity of a free surface. Physics of Fluids, 28(5). doi:10.1063/1.4949354 . Koukouvinis, P.K., Anagnostopoulos, J.S. and Papantonis, D.E. (2013). Simulation of 2D wedge impacts on water using the SPH-ALE method. Acta Mechanica, 224(11), pp. 2559–2575. doi:10.1007/s00707-013-0885-3 . Koukouvinis, P.K., Anagnostopoulos, J.S. and Papantonis, D.E. (2013). An improved MUSCL treatment for the SPH-ALE method: Comparison with the standard SPH method for the jet impingement case. International Journal for Numerical Methods in Fluids, 71(9), pp. 1152–1177. doi:10.1002/fld.3706 . Koukouvinis, P.K., Anagnostopoulos, J.S. and Papantonis, D.E. (2011). SPH method used for flow predictions at a Turgo impulse turbine: Comparison with fluent. World Academy of Science, Engineering and Technology, 79, pp. 659–666.